Remember those photos that Mr.Handsome and I captured on my birthday? If you can't remember or have not seen them, you can click HERE! I decided to use them on my first Twisted Sketches DT layout - sketch # 18. This week's twist is to use ribbon. I stamped "XOXO" on the ribbon & I actually loved it! Be sure to join us ok? love this babe...as usual..hehehe..oh no..hope Eric recovers soon! You guys are so lovely together!! But the layout, oh my, DELICIOUS! hey, congrats on your ts-dt-spot!! you did such a great job with your layout!! sweet layout with the Amy Butler papers ! fab take of the sketch too ! That's gorgeous Jessy, love it!!! Awesome LO, Jessy. 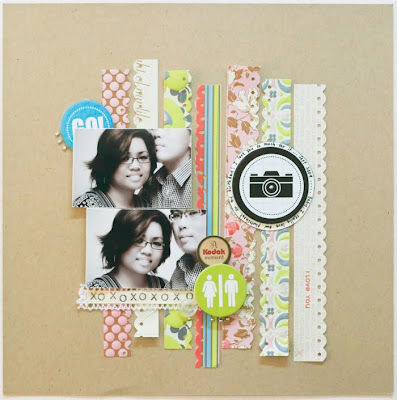 Love those paper ribbons and those photos too!! Lovely layout- those are my fave pp too. Hope E gets better soon.